Our physical, occupational and speech therapists work with you and your child to establish a unique program, tailored to your child, which focuses on achieving the maximum results possible. Each of our therapists is specially trained and fully qualified to work with pediatric patients of all ages and across a variety of different challenges. Whether your child is recovering from an illness or injury, or is experiencing developmental or emotional challenges, we will work with you and your child to succeed beyond your wildest dreams. 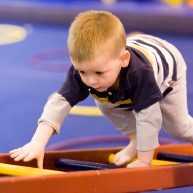 Pediatric Physical Therapists work to help children reach their maximum potential for functional independence. They focus on issues of balance, gait, motion, muscular control and neurology. Pediatric Occupational Therapy focuses on helping children with motor skills development, self-care skills, sensory processing, academic skills, as well as social and emotional challenges in order to maximize their ability to function in everyday life. Pediatric Speech Therapy focuses on the physical and cognitive skills and abilities related to communication. Speech therapy also helps pediatric patients with issues related to feeding and eating.